Williams, Arizona, Thursday July 15, 1915, “Found Cadillac and Stutz crews at Harvey Hotel at Williams waiting for us. All got supplies at garage. Talked to Ford agent. Got going about eleven. Had lunch at Ash Forks. Loafed along; found it very hot. Bought some gas and oranges at Seligman. 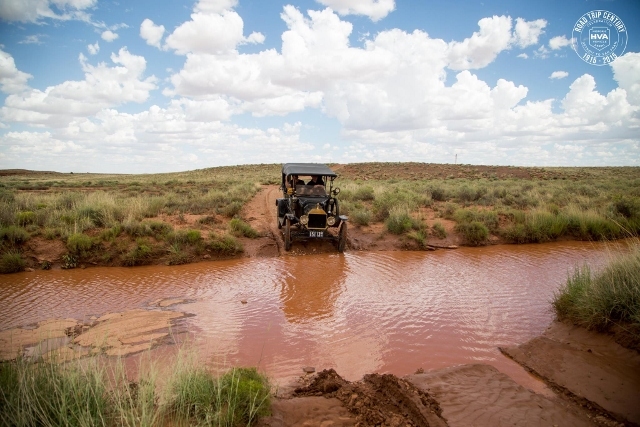 Stutz broke another spring about 15 miles out and returned to Seligman. Cadillac and Ford went on to Kingman, arriving at midnight, Brunswick Hotel. Very rough and dusty roads. Wired Los Angeles Branch for axle parts. Day’s run 146 miles.” Edsel Ford. I do not know what book Edsel used to guide him on his westward journey through the deserts along the National Old Trails Highway. However, I do know that by 1915, incredibly, the American people were taking to the “highway” in ever increasing numbers. In 1915, as the first world war exploded in Europe, more than 20,000 people who attended the Panama-Pacific Exposition in San Francisco arrived by automobile. An overwhelming percentage of these people arrived from outside the state of California. That was the destination for Edsel and his pals. Daily, newspaper accounts of adventures and the stunning sites seen along the way enamored readers. Heavily publicized manufacturer sponsored races, endurance runs, and tours, and illustrated books written by celebrities such as Emily Post who chronicled her adventure from New York to California in a popular book entitled By Motor to the Golden Gate fueled the natural American wanderlust. “…coming out on a mesa, you see spread below you the Painted Desert! It can be none other. You would be willing to take oath that a great city of palaces in all the colors of the rainbow lies spread before you.” From By Motor to the Golden Gate. The national fascination with the great American road trip further fueled what was already an unprecedented sellers market and automobile manufacturers fought for a share of the booming market. At one point during the early teens, there were more than three hundred automobile companies. Good Road Associations throughout the country were publishing detailed guide books. So did AAA, the Automobile Club of Southern California, countless civic groups and individuals, and even automobile manufacturers. Today, these century old guide books provide a unique look into a lost world where the son of Henry Ford shared the road with wagon trains and cowboys pulled stranded automobilists from deep desert sands or muddy river crossings. In many western communities the garage was also a blacksmith shop as well as dealership, and the stagecoach was still a trusted mode of transportation. This was a world with one foot in the stirrup and the other on the throttle. This past Sundays adventure include a brief drive along a segment of the National Old Trails Highway that carried Route 66 traffic throughout Truxton Canyon until 1939. To chart our course I selected a 1913 edition of the Arizona Good Roads Association Illustrated Road Maps and Tour Book. The railroad bridge indicated in the book is gone, a victim of the 1939 flood that resulted in a realignment of Route 66. The beautiful cut stone supports from the late 19th century, however, remained. The 1913 guide book noted that this section of road was, “bad and rough between hill and R.R.” There was also a warning about deep sands. Traveling the lost highways and dusty trails is, as with two lane odysseys, a grand adventure. However, abandoning the navigational tools of the modern era and instead resorting to century old guide books that adds a sense of time travel enhances that adventure immeasurably.